A crane is a useful piece of equipment at a construction site. Unfortunately, it can also be deadly for workers if not used properly. The Occupational Safety and Health Administration (OSHA) estimates that in 2009, 50 percent of crane accidents in the U.S. caused fatal injuries. These accidents are often preventable; it’s estimated that 90 percent of crane accidents are due to human error. If you were involved in a construction site accident involving an overhead crane, you need the insight and wisdom of the attorneys at The Orlow Firm. We have more than 30 years of experience handling Queens crane accidents and other construction accidents. Although we have handled thousands of cases, no two cases are the same. We focus on the individual needs and circumstances of each of our injured clients. Learn how we can help you after you’ve been injured in a crane accident at a construction site. Call The Orlow Firm at (646) 647-3398 or contact us online. We represent clients throughout the New York City area, including Queens, Brooklyn, Manhattan and Queens. It is the employer’s responsibility to ensure that operators of large machinery such as cranes have been fully trained and licensed and that the working conditions are safe. Everyone working on a construction site with an overhead crane needs to be aware of safety precautions that must be followed. A crane contacting a power line is the most common type of construction site crane accident. This type of accident usually results in electrocution and causes the majority of crane accident fatalities. OSHA has established guidelines for the use of any attachments on overhead cranes, stipulating that they are not to exceed the rating, capacity, scope or recommendation of the manufacturer of the crane equipment. If you have been injured in a crane or another type of construction accident, you should contact a lawyer as soon as possible to discuss your rights to compensation. Even if you are receiving workers’ compensation, you may be eligible for additional damages if your injuries were caused by a third party. Settlements and verdicts awarded to victims of crane accidents caused by third-party negligence are typically much greater than workers’ compensation. Contact The Orlow Firm to talk to an experienced crane accident lawyer in Queens. Our qualified and experienced lawyers will offer a confidential and honest assessment of your case. 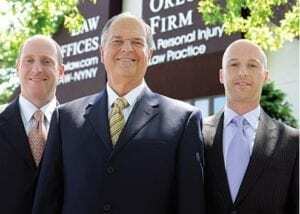 All fees to the law offices of The Orlow Firm are strictly on a contingent basis, meaning that the attorneys are paid only if they recover money damages for the client. Call (646) 647-3398 or contact us online today.